The drawing icons select what type of drawing action you do when you touch the pattern grid. is for freehand drawing, it leaves color wherever you touch. are for simple shape drawing by dragging across the grid. allows you to select a part of the pattern and copy it somewhere else. Drag to select the area you want to copy, then drag that area to where you want the copy to go. With this tool, you can quickly replicate borders or motifs across your pattern. Background color will not be copied, so that patterns can be picked out of the background and placed on other color. Backstitch, including its absence, is always copied, so copying an area of plain background color is an effective way to remove backstitch from areas where you don't want it. erases color and backstitch where you touch on the grid, replacing them with the background color. A quick touch will just erase a single grid cell, but if you touch and hold without moving, the erased area grows larger, allowing you to erase larger areas more quickly. picks the color from a grid cell when you touch it. fills a flat colored area of the grid. We are quite fond of the animated crinkly edged fill effect here. allows you to quickly add writing to your pattern. Enter your text in the pop-up box, select font, size, style and weight, and when you press "Ok" you can place the text on the grid. If you want to change the text, click it again. If you don't want to place the text, click on another icon. You will be told if the text is too wide for the pattern. If so, you might want to use a smaller font or less text, or make your pattern grid larger. allows you to add backstitches to your pattern, by dragging between cell corners. These are often used for enhancing cross stitch patterns, but could potentially be used with other craft types too. Since backstitch is thinner than a normal grid cell, it is only shown, and can only be added, when the grid cells are large enough. To add backstitch to a very large pattern, you will need to zoom in to the area where you want it. Grid settings in the Edit menu allows you to change the number of cells in your grid. More cells give more detail, but fewer cells make your pattern easier to make. The grid lines can also be turned on or off here. allow you to change the shape and position of grid cells. Click or drag the cell corner to change its shape. Different settings would suit different crafts. Cross stitch typically uses 1:1 squares with normal rows. Some weaving might use 2:1 rectangles with staggered rows. Hexagonally arranged beading could use 6:5 rectangles with staggered rows. Clear in the Edit menu removes all drawing and color selections, allowing you to start a new pattern. The Pattern Grid library allows you to use part of other patterns in your own pattern. For example, the library contains a pattern with tiny backstitch letters in it, which you can copy into your pattern to make tiny words. Get pattern in the Library menu opens up the Pattern Grid library. Here you can browse the patterns in our online library, and you can open pattern files on your computer as if they were in the library. If you want to see more detail or use a patterns from the library, click it and it will open a new pattern window. You can have many library pattern windows open at the same time, if you want. button a few times. We recommend doing this, and closing the library browser window, so that you can see both your pattern and the library pattern clearly. allows you to select a part of the library pattern and copy it to your pattern. Drag to select the area you want to copy, then drag that area across to your pattern where you want it to go. It works the same as the select tool in your pattern, except it does some interesting things with color. If your selection only has one color (apart from the background), the copy will be made using your currently selected color. Which means you can copy selections in your choice of color! Otherwise, if there are multiple colors, or the library pattern has no background, it will try to use the colors from the library pattern. The library pattern window will explain what it's going to do with each selection, and will preview the result when you start to drag it. If you don't like it, throw it away off your pattern. rotates the library pattern, so that you can copy from it rotated. This is particularly useful if you want to have vertical or upside-down text in you pattern. For example, open a letters library pattern, rotate it to upside-down, then you can copy upside-down letters to your pattern. Tip: If you want to rotate part of your pattern, here's a way: Save the pattern to file, open the file in the pattern library browser, rotate it and then copy it back to your pattern. Add to library in the Library menu allows you to add your pattern to the library. This will allow it to be used by other Pattern Grid users, making the library more useful for everyone. We ask for some more details about the pattern, and we also do some analysis of it. The most useful library patterns have structure, not color, so we ideally want a single color and/or backstitch over a plain background. However if you're adding patterns that need the color, feel free to ignore these comments. The library may (we hope) get quite big, so you can search for patterns with particular keywords, for example "letters" or "border". When you add a pattern to the library, you can pick keywords (more than one if you want) that describe the pattern contents. This will make your pattern easier to find. If you think there are other keywords that describe your pattern, you can also suggest those. The tracing tools allow you to draw over an image, such as a photo or other picture file. Auto trace in the Tracing menu automatically converts an image to a pattern. It will pick the best colors to use, then draw the whole pattern with those colors. If you have a problem with the conversion, you can change the settings and re-run the auto trace any time. For example you might decide the pattern would look better with more colors, so you could increase the number of colors in you palette and select auto trace again. Auto trace will replace your whole color palette and pattern, so you can't use this if you want to preserve existing work in the current pattern. The Tracing menu's New tracing image option allows you to open a new image to trace. allows you to use colors from the tracing image. Touch the image to add the color there to the palette. If you're using a limited color source, such as DMC, the nearest matching color will be added to the palette. For manual photo tracing, you might start by using this color picker to select all of the different colors you want to use from the photo, before using the magic brush to automatically draw the pattern. looks at the color in the image to select a color already in your palette, and draws that color on your pattern. A single click will look at the color at that exact point on the image, which is good for detailed corrections. A dragged touch will look at the average color over a grid cell. automatically colors part of your pattern from the image, using the colors in your palette that match the tracing image. Normally this will use the average color over a grid cell, but sometimes it picks out highlights where there is a particularly good color match. automatically colors the whole of your pattern from the image, using the colors in your palette that match the tracing image. This can be very useful after using Auto trace if you want to set your own colors in the palette, change the image zoom, or experiment with the dither or edge sharpness level. allows you to change how clearly you can see the pattern, or the tracing image. For example you might want to see the image clearly when picking colors, both when tracing manually, and only the pattern grid when developing your pattern further. It's not just a banana! Remove image in the Tracing menu removes the tracing image, leaving just your pattern. You might want to do this when your pattern is complete, before publishing or sharing your pattern. Tracing settings in the Tracing menu allows you to change settings used when auto tracing or using the magic painting tools. Dither affects how colors are blended as the shade changes. Dither adds some noise you your pattern, as it blends colors by placing them alternately to achieve the right blend. You should use low dither for small grid sizes with a large color palette, as the palette can do the work of providing the right colors. But for large grid sizes, higher levels of dither can produce very realistic blend effects and eliminate color banding. Edge affects the sharpness of edges when tracing. Soft edges blend the color over the edge, which looks good in large patterns. Sharp edges make a clear selection between one side or the other on an edge, this can be more useful when tracing with a small number of grid cells, to enhance pattern definition. Brush allows you to change the size affected by the magic brush. Pattern Grid gives you a limited size palette, which reflects the way that real work is done with a limited range of colored threads available. To draw with color in Pattern Grid, you first need to add colors to your palette. You can add colors from one of our color sources. A new color will be placed in an unused palette spot, if available. You can change an existing palette color by selecting it, then picking a new color. The first color is used as the background color. This is the color the erase tool uses. If the "background color" option is set in Color Settings, this color is marked "bg", and it appears as blank areas in the charts. For crafts where background is not a sensible concept, un-tick the background color option. Colors can be rearranged by dragging them to their new location. Colors can be removed by dragging them off the palette. The "Full color" source allows you to select any color your screen can show. Touch the hue and shade you want. These are named with their RGB value and a name from the wikipedia color list page, filtered by us to remove similar colors and use our preferred color names. 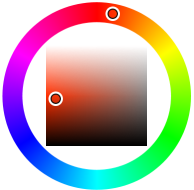 The "DMC palette" source contains colors from the DMC 117 thread range. Touch the color you want. These colors are our own sampling of the DMC color range. On screen representations of thread colors can never be totally accurate. Please check real thread colors before using them. The DMC Palette color source is a computer generated image which attempts to place similar colors near each other. We think it looks quite pretty. 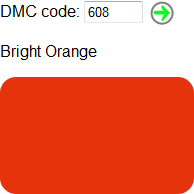 The "DMC number" source contains colors from the DMC 117 thread range, selectable by DMC number. Type in the DMC code you want. When the Pattern Grid palette has a color from the "Full color" source, the DMC color name will be called "Similar to...". You can then set that palette entry to the DMC color by clicking the green "set" icon. This color source is probably most useful when you want to design a pattern with threads you already have. Undo and redo actions are similar to those found in many other apps. Undo steps are stored after a one second pause in your changes, so if you work very fast, they might be quite big steps. There are 10 undo steps remembered, so don't go crazy with changes you don't want! is the undo button. It can also be found in the Edit menu as Undo. is the redo button. It can also be found in the Edit menu as Redo. The zoom and scroll icons allow you to zoom in and out on the grid, or tracing image, and view different areas in more detail. There are version of these icons for both the drawing and tracing tools. When the tracing image is zoomed and positioned, it will be locked to the grid, so grid zooms will keep the tracing image correctly in place. zooms into the pattern grid, or makes the tracing image larger. zooms out of the pattern grid, or makes the tracing image smaller. allows you to move around a zoomed-in pattern grid, or changes where the tracing image is relative to the grid. Chart as web page in the File menu creates a printable chart web page that shows you which colors go where to make your design. To print this well, you may need to reduce the margin sizes in the printer page settings for your browser. Please check how it will print with your browser's Print Preview options before printing. Save to My Patterns in the File menu will add your pattern to your own private online gallery called My Patterns. You can keep a number of patterns here, and come back to view or edit them later. Once a pattern is in My Patterns, you can request it is published to our public gallery by clicking the "publish" link. PDF charts are created for patterns saved in My Patterns. View the pattern to see the PDF chart. Unfortunately we can't create PDF charts for patterns with more than 100,000 cells. Please contact us if you particularly need a PDF chart for a very large pattern. To use My Patterns, you will have to register an email address and make up a password to log in. We will keep these secret, and won't send you junk mail. Your pattern will be saved in your browser automatically, so you can leave the page, close the browser and shut down your computer, and it will re-appear when you come back. But the automatic save will only remember your current work and isn't backed up, so you can also save and load your designs as files as well as in My Patterns. Save file in the File menu will create a file for your browser to download. This file will contain all the details of your pattern, ready for you to view or edit again later. Open file in the File menu will open a popup where you can search for a file and open it, to view or edit the pattern stored in it. This will only work with pattern files saved from Pattern Grid (These are saved to your default download directory and are usually called "pattern" or "pattern.grid". There may be a number added if you have several saved files. ).